7″ x 10″, softcover, 215 pages, Island Press. Good public space and street design can dramatically improve a downtown’s walkability, and enhance social and commercial activity. 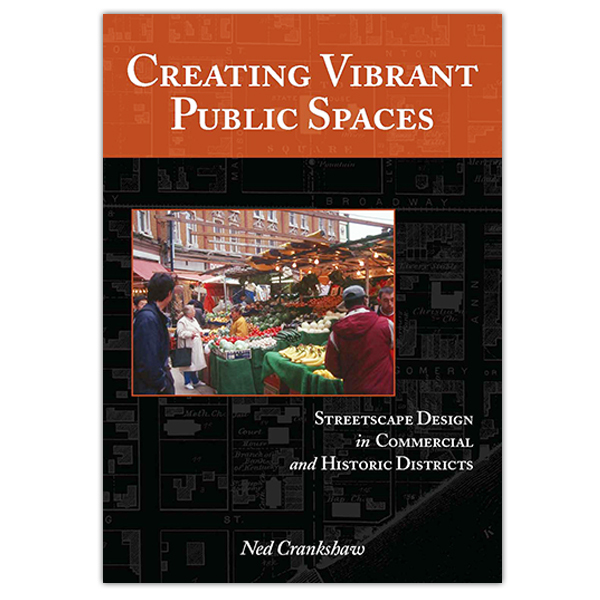 In this very readable book, author Ned Crankshaw combines practical experience, compelling case studies, and design guidelines to help every downtown improve the quality of its public spaces while respecting their historic character. The book draws examples mainly from smaller cities and larger towns, but the principles apply across a wide range of downtown districts. The design guidelines emphasize historic authenticity along with improvements suited to modern visitors, shoppers, residents, workers, and others. Ned Crankshaw is an Associate Professor of Landscape Architecture at the University of Kentucky. He has written about streetscape design in historic commercial districts in numerous journals and magazines. Creating Vibrant Public Spaces is guaranteed. If you are not 100% satisfied, you may return it within 30 days for a full refund.